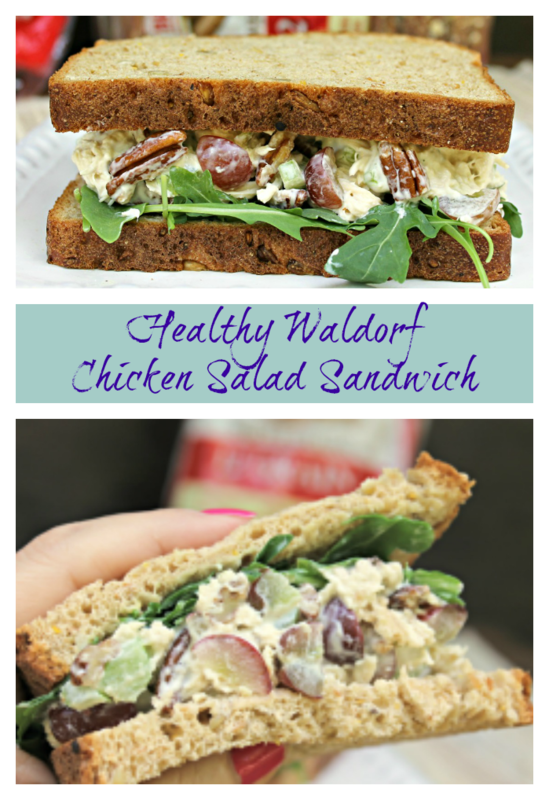 Waldorf Chicken Salad Sandwich Recipe + Brownberry Prize Pack Giveaway! I love summer, don’t you?! This is the time of year I can relax a bit and really enjoy my family. With only a few months of summer break, we try to make the most of our time together. Because my husband works during the week, we keep the weekends open just for the family. We may just grab a matinee or play a few rounds of miniature golf. If the weather is clear and the temperature is not too high, we love to have a picnic at a local park. 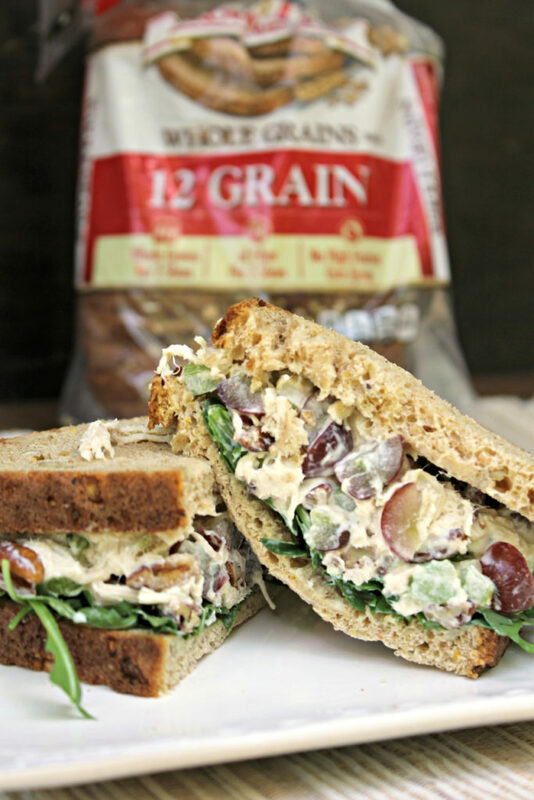 When we do, I a sure to pack plenty of sandwiches using our favorite Brownberry® Whole Grains Sliced Bread, filled with my Waldorf Chicken Salad. 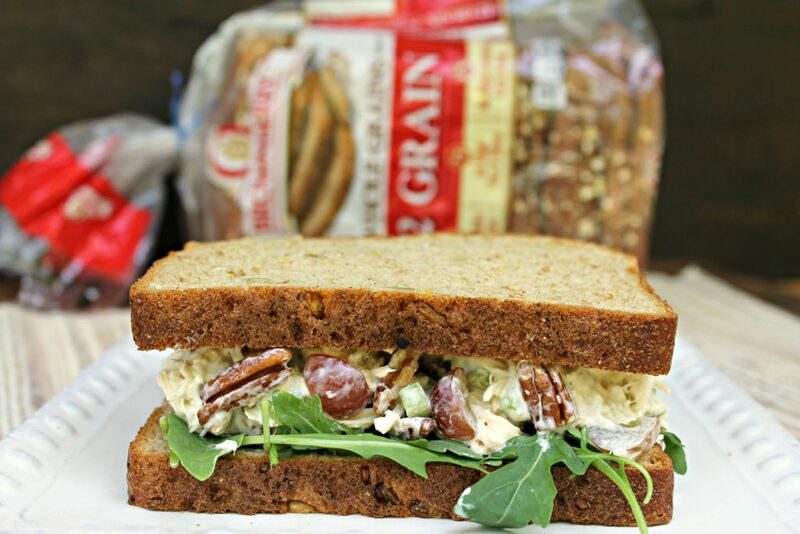 Brownberry® Bread wants to hear what healthful ingredients YOU use to make the perfect sandwich with their delicious, made with whole grain bread, so they are hosting the “2016 America’s Better Sandwich” Contest! 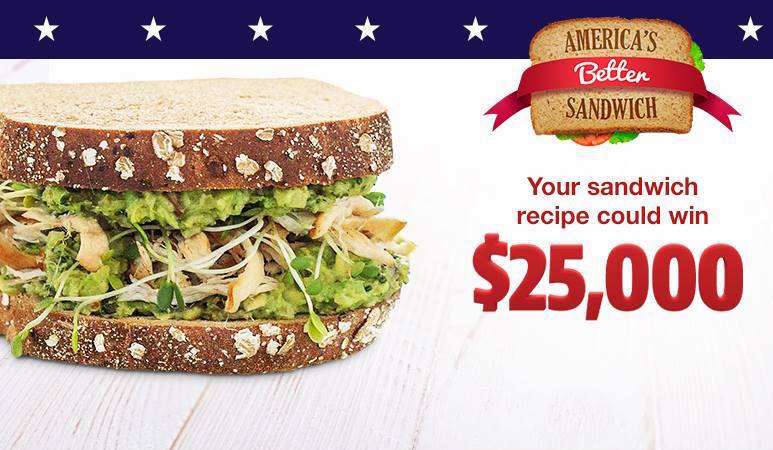 To enter, submit your recipe at http://americasbettersandwich.com/ for the opportunity to win a grand prize of $25,000 – now, that’s a lot of dough! Additionally, the sandwich in each of the five categories with the highest overall score will receive a $5,000 Category Prize. 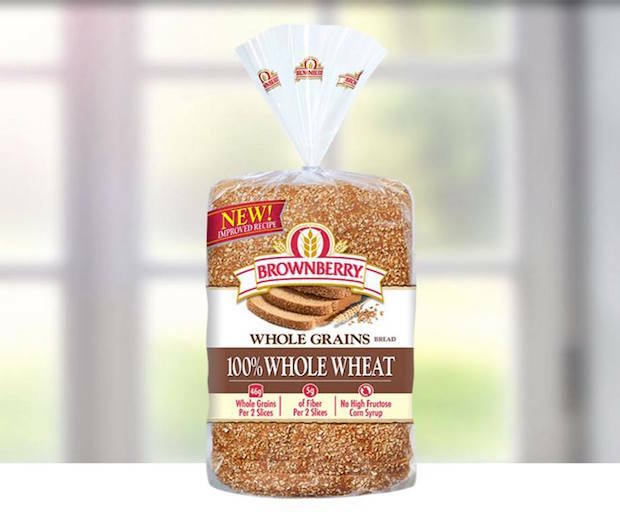 Making sure no grain gets left behind, this year, Brownberry® Bread will donate one (1) loaf of bread to Feeding America for each entry and or vote submitted, with a minimum of 75,000 and up to 100,000 loaves donated! Reader Giveaway: One lucky Thrifty Recipes reader will Brownberry Prize Pack that includes six coupons each valid for $5.00 off the purchase of any Brownberry® Whole Grain Sliced Bread of choice, six coupons each valid for $4.00 off the purchase of any Brownberry® Sandwich Thins® Rolls of choice, $25 Visa gift card to use towards ingredients for your favorite sandwiches! To enter, just complete the entry form below by 11:59pm ET on 8/11/16. Good luck! NOTE: The coupons for product redemption, information, and gift card have been provided by Brownberry® Bread. My favorite sandwich ingredient is Swiss cheese! My favorite sandwich ingredient is lettuce. My favorite sandwich ingredient is peanut butter. My favorite sandwich ingredient is tomatoes! My favorite sandwich ingredient is home grown tomatoes. I can not have a sandwich without lettuce! I love bacon and cheese on a sandwich! My fave ingredient is tomatoes! i love a sandwich made with cold meatloaf! My favorite sandwich ingredient is swiss cheese. My favorite ingredient is cheese or peanut butter. I like to make gill cheese sandwiches and peanut butter & jelly sandwiches for the kids. My favorite sandwich ingredient is tuna salad. I really like Wickles Pickles relish in many of my meat salads…..ie Tuna, chicken, ham, or seafood. My favorite sandwich ingredient is turkey. My favorite sandwich ingredient is an avocado! Tell us your favorite sandwich ingredient! My favorite sandwich ingredient is light mayo. My favorite sandwich ingredient is butter. My favorite ingredient is mayo. My favorite sandwich ingredient is mayonnaise! I love chicken. So many delicious ways to put it on a sandwich! I have to have pickles on my sandwiches. I must have a slice of tomato. I like ham and cheese. My favorite sandwich ingredient is avocado! My favorite sandwich ingredient is avocado. Cheese, pickles, mustard and tomatoes are my favorites. My favorite on almost any sandwich is bacon. Almond butter is my favorite sandwich ingredient! My favorite sandwich ingredient is creamy Italian Dressing. I really love mustard, thank you so much for the great offer! My Favorite Sandwich Ingredient Is Cheese! My favorite sandwich ingredient is turkey! And mayo! I can’t just choose one, they both have to be on there! I love lots of pickles on my sandwiches. I love turkey, apple & gouda grilled cheese . Favorite sandwich ingredient is tomatoes. Cheddar to be more precise. a sandwich taste best with tunafish! I love a BLT-can’t wait till summer when we have fresh tomatoes, ours are almost ready! Hummus is my favorite sandwich ingredient! Spinach is so much better on a sandwich than lettuce! My favorite sandwich is a BLT! Egg salad is my favorite. My favorite is roast beef. I really love having tomatoes on my sandwiches. My favorite sandwich ingredient is cheese. I love bologna and may on my sandwiches. My fave sandwich ingredient is peanut butter! My favorite sandwich ingredient is strawberry jelly! I love a cold meatloaf sandwich with mayo, yum! This is a great way to spice up a boring lunch! My favorite ingredient would be an heirloom tomato fresh from my garden. My favorite sandwich ingredient is all kinds of mustards. The hot kinds are my favorite. Oh I have to say green/red/orange peppers from our garden! I like using turkey, bacon,and avacado on my sandwiches. Pickles it always need pickles. My favorite sandwich ingredient is cheese, especially gouda cheese. I love avocado on everything!! Tomatoes are my favorite sandwich ingredient! I love pickles and brown mustard on my sandwiches. Avocado is my favorite ingredient. My favorite ingredient is cheese. I love tuna with celery, egg, onion and mayo! Dijon mustard is my favorite sandwich ingredient. Yummy! My favorite sandwich ingredient is cheddar cheese. Most of my sandwiches are served with a handful of arugula! I like tuna fish salad. My favorite sandwich ingredient is mayo. It goes well with any meat. That looks so good. I love a good tuna salad sandwich with eggs! I like onions in my sandwich the most. My favorite part is shredded cheddar. I like to have honey ham in my sandwiches. I love cheese on my sandwiches. Provolone or swiss or even American is yummy to me. Avocado slices are my favorite addition to a sandwich. Alfalfa Sprouts are my favorite sandwich ingredient! Tuna, mayo,green olives, and cheese. I love cheese on a sandwich! I love blts and grilled ham and cheese. My favorite sandwich ingredient is salami. Mustard is my favorite to add to sandwiches. My favorite sandwich ingredient is ham. My fave ingredient for sammies is tomato. My favorite sandwich ingredients are cheese and Bacon. My favorite sandwich ingredient is cheese! I love a super cheesy sandwich! favorite sandwich ingredient is lettuce. My perfect sandwich needs avocado! I like turkey! My favorite! Especially with some mayo, cheese and pepper! My favorite ingredient is bread. It’s necessary in order to make a sandwich. I love cheeses. A simple grilled cheese can be fabulous with a good cheese. My favorite ingredient on a sandwich is cheese with tomatoes. Pickles are my fave sandwich ingredient! Yum! Sliced avocado is my favorite ingredient! My favorite sandwich ingredient is bacon. Bacon! I have a lot, love a yummy BLT with miracle whip. My favorite sandwich ingredient is a fresh tomato slice. My favorite sandwich ingredient is mustard! I love egg salad for a sandwich… not every day though! My favorite sandwich ingredient is tomatoes. I have to add them to every sandwich I make (except peanut butter). I love mayo on whatever sandwich I am making. I like turkey and mustard in my sandwich. my favorite sandwich ingredient is hummus. i love it so much. I love just about any sandwich with cheese. White cheddar is my favorite. My favorite sandwich ingredient is onions. It makes the sandwich very elegant. I heart the roast beef! I love tomatoes on a sandwich. I like a good tuna salad sandwich. I have to have those grapes!!!!!! Mine might be different but I enjoy a bologna and potato chip sandwich. My favorite is longhorn cheese, if I do not have my slice of longhorn I won’t eat it! My favorite sandwich ingredient is muenster cheese. It is so yummy! My favorite ingredient for my sandwich is horseradish! My favorite sandwich ingredient is avocado, thanks for the chance to win ! Spicy brown mustard is my favorite. My fave is the cheese! I suppose tomato is my favorite sandwich ingredient, I like lots of veggies in general. I love avocado on sandwiches. I would have to say mayo is my favorite ingredient. Thank you! Cheese is my favorite sandwich ingredient. My favorite sandwich ingredient is cheese. I very rarely make one without it. But I also love avocado mucho grande!! My favorite sandwich ingredient is fried green tomatoes. Mine is either mayo or hot spicy mustard. It depends on the lunch meat I am eating..
Brownberry Bread is my favorite! My favorite ingredient is peppercini’s! Cheese for sure. I cant eat a sandwich without cheese. i love whole grain mustard! My favorite sandwich ingredient is fresh home grown southern tomatoes! Banana peppers are my favorite sandwich ingredient. 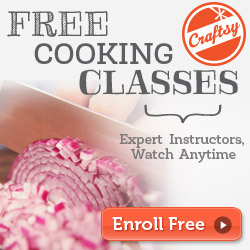 My favorite has to be onions… I am addicted to onions, fried, sauted or fresh. My favorite sandwich ingredient are sweet onions. Turkey is my favorite sandwich ingredient. My favorite sandwich ingredient is: potato chips-have to add something crunchy. I don’t eat potato chips on the regular, I will only buy them to add to a sandwich. I HAVE to have mayonnaise! That recipe sounds delicious! Mayo is my favorite ingredient. my favorite is a great 1000 island relish. Real mayonnaise ftw, it makes any sandwich that much better!